Canadian band Harem Scarem released their major label debut way back in 1991, an innocuous yet superbly crafted melodic rock record which was quietly well-received. They then went on to produce, to my mind, two of the very finest albums in the history of the genre: the seminal Mood Swings from 1993 (which was harder and took more chances than the debut) and 1995’s Voice of Reason, a record that was so forward-thinking many AOR buffs just couldn’t take it. Both were exquisite releases for different reasons: Mood Swings was genre-defining; Voice of Reason was genre-busting. When you’ve achieved this much with your first few releases, it’s fairly impossible to keep blowing people’s minds. As a result, Harem Scarem have found their early fanbase hard to please ever since. I have to confess that, as Harem Scarem’s career continued with a prolific stream of strong, if much safer, releases, I lost interest. In fact, I stopped paying attention somewhere around 2002’s Weight of The World, and barely even noticed that the band officially ceased to be in 2008. That said, I very much enjoyed the anniversary edition of a re-recorded Mood Swings, released last year, and its three new studio tracks revealed a band that had really benefitted from the five years off. 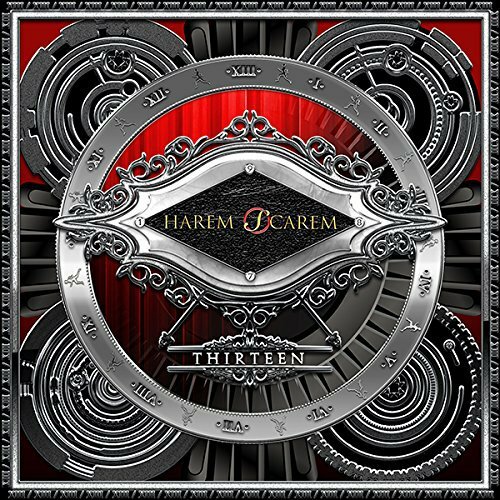 I’m happy to say that their latest release, Thirteen, continues in that vein and Harem Scarem sound like a band refreshed, rejuvenated and refocused on their ability to write first-rate melodic hard rock, even if they’ve long since abandoned breaking new musical ground. They do permit themselves plenty of rock clichés here: the catchy ‘All I Need’ is fun but would sound more at home on a Nelson album and the big ballad ‘Whatever It Takes’, while stirring, is actually fairly expendable. The very out-of-character southern bar-rock cheese of ‘Live It’ had me quite worried, as I always think of track two as somewhere bands should bury their gold. Elsewhere, however, Harem Scarem are seriously impressive and more than atone for the aforementioned misdemeanours. They still remain pig-headedly unafraid of bolder, darker themes: war and the futility of idealism is tackled in the super-riffed opener ‘Garden of Eden’; the decline of civilisation is bemoaned in the otherwise jaunty ‘Early Warning Signs’; the human conscience is probed in the excellent ‘Midnight Hour’ and the album-closing epic ‘Stardust’ carries the pointlessness of existence as its central message. Now, that’s the cynical Harem Scarem I know and love! All this is dressed, as you would expect, in the trademark songwriting and glorious production quirks of Harry Hess & Pete Lesperance, with jawdropping guitar work, lashings of triple-parked vocals, curveball time changes, and energy and melody in equal measure. Detractors will, of course, say that they’ve heard it all before: the trusty HS trope of heavy, minor key verse exploding, often via modulation, into a super-catchy major key enormo-chorus, drenched in BVs. Of course, there is such a blueprint in operation on Thirteen, but the point is simply that nobody does it like Harem Scarem. After all this time, they still stand head and shoulders above the majority of their peers. We may have come to take their sound and style for granted and perhaps, at times during their twenty-five year career, so have they. The difference with this album, though, is that it sounds relaxed and confident, rather than forced and try-hard. It’s the sound of a band that can write and make records with such care, craft and panache that they really have nothing to prove. I reckon that if this was Harem Scarem’s very first album, melodic rock fans the world over would be hailing them as gods. If you’re a lapsed fan like me, then Thirteen could well be the album to restore your faith.